We carry Ctek MXS25 Pro Battery Charger - the smartest battery chargers in the world! The MXS 25 is a professional 12V charger. It offers efficient and fast charging. The MXS 25 is equipped with all necessary features and functions to solve a broad range of battery related problems. It offers features such as battery diagnosis that shows if a battery can receive and retain a charge, a special reconditioning function that restores stratified and deeply discharged batteries, unique maintenance charging and a temperature sensor for optimized charging regardless of the weather conditions. It also has a power supply mode which allows the battery to be disconnected from the vehicle without losing important configurations. 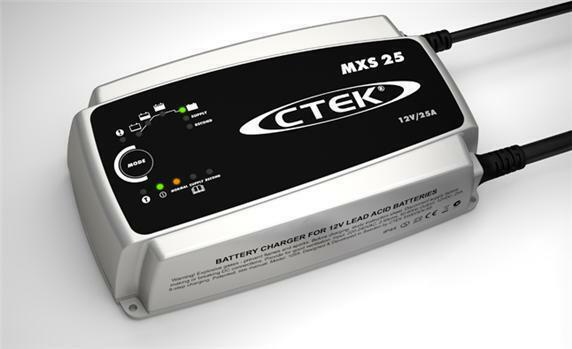 The MXS 25 is a fully automatic 8-step charger that delivers 25A to 12V batteries from 40–500Ah. The charger is IP 44 classified (outdoor use), designed to protect vehicle electronics and non-sparking, reverse polarity protected and short-circuit proof. Using a unique charge algorithm, CTEK Smarter Chargers go through 8 steps to constantly read and communicate with your battery, charging only to its direct needs and therefore avoiding any possibility of incorrectly charging the battery. Furthermore, by ensuring the battery is conditioned as well as charged, your batteries last significantly longer. Moreover, each CTEK Smart Battery Charger regulates mains voltage to protect any sensitive electrical and hi-fi equipment.